The rubber bushing of the tension rod has been replaced with pillow balls (spherical bearing) in all TEIN’s Pillow Ball Tension Rod to eliminate tow change through compliance on acceleration or deceleration and allow only for vertical movement by the lower – arms. It also reduces the roll at corners and creates quicker steering response. In addition, the wheel alignment (caster angle) can be set through adjustments. 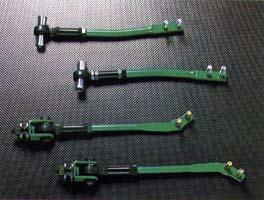 *By adopting NMB’s 3 piece rod end – HRT16E – we have achieved outstanding endurance for the products. *Protective boots for better weather resistance with the safety regulations. *Machine structured carbon steel – S45C – has been adopted for the Tension Rod. *High tension material SCM435 has been used for the bolt. As it is already pressed in the rod, installation time has been reduced. *Pillow Collar is structured carbon steel – S45C – has been adopted for the material with high anti – corrode nickel – plated. *There is 10mm adjustment width on the lock nut. The original setting is at the center, so adjustment can be made on the range of / 5mm (/ 15mm for those with turn buckle).